I must preface this with the fact that anyone who’s ever had this farfel dish loves it. It is steeped in tradition, it was made absolutely the best by my Grandma Regina, and only seconded by my mother (G’ma Millie). It is a very tricky dish to make, and after many failed attempts, I figured out that doubling it doesn’t work, and you must let it dry out!!! It should probably sit out to dry for at least 2 hours. I know this sounds crazy, but it’s true. Of course, G’ma Regina never wrote a single thing down, so you’ll be winging the spices and the oil, because I always do. It’s not the healthiest thing in the world, but it’s so delish and we only make it but once a year. When I was little I couldn’t wait to have it at my grandparents’ house. We looked forward to it every year at Seder. It’s no surprise that it’s Joel’s favorite. He remembers my grandmother’s and that’s a tough act to follow even after all these years. It’s tradition in our house to always have it on Passover, and what better way to remember Grandma Regina. There is no better legacy to a great cook than a well cooked farfel. Beat eggs with spices (the paprika will add a red color). Coat the farfel with the egg mixture. Add oil to a large heavy skillet, about 1/4 inch deep, and heat over medium-high flame. Toss farfel in the hot oil, and coat well; farfel should brown a little bit. (Don’t burn.) 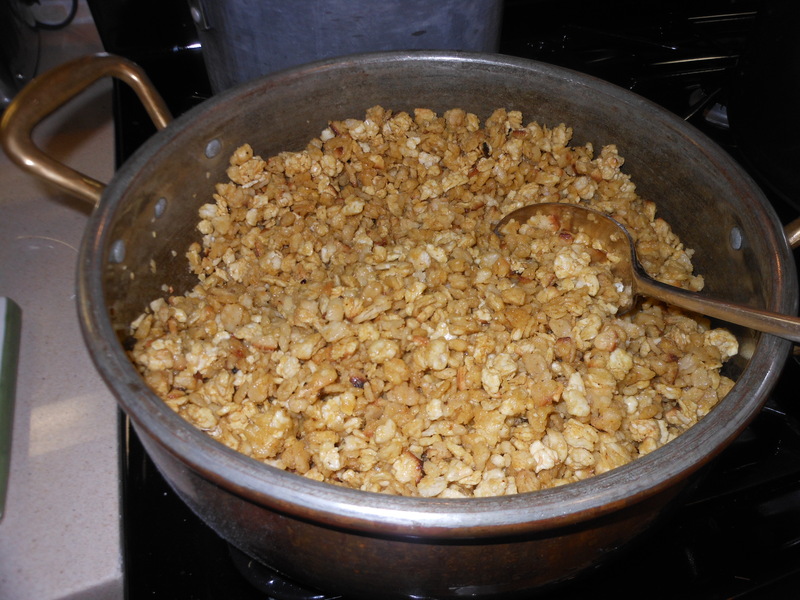 Then add water to just cover the farfel, bring to a boil, then simmer until water dissolves. After the water is all gone I turn the flame off and just let it sit there and dry out. I cannot emphasize enough how important this step is. Go out and do something else, and come back to it. Meanwhile, in a separate pan, saute the mushrooms and onions with salt and pepper and a dash of paprika here as well. The farfel is very bland and you’ll need the salt and pepper. Put this in a container ’til you’re ready to use it. You will eventually add it to dried out farfel. 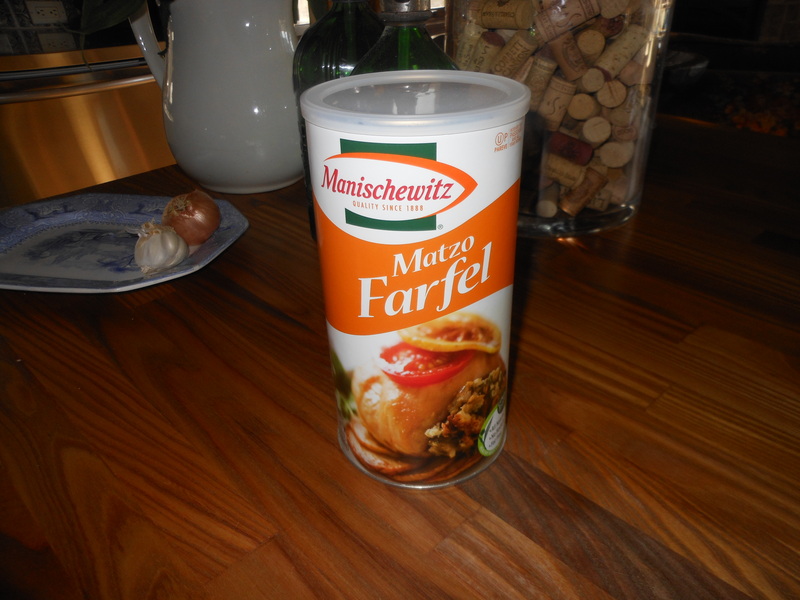 When farfel is completely dried out (at least 2 hours), add the mushroom and onion mixture to it. Taste for salt and pepper. Mix well and bake in a Pyrex dish at 375 degrees for about 1 – 1/2 hours. You want it to get crispy. If it’s too dry, add a little more oil to baking dish. Stir it often–you’ll have to open oven a few times and stir. Your house will smell great while making this. My family likes this on the crispy side, so I let it cook for a long time, but you’ll be able to tell when it’s done–it will be bubbly and crispy! Enjoy and good luck! 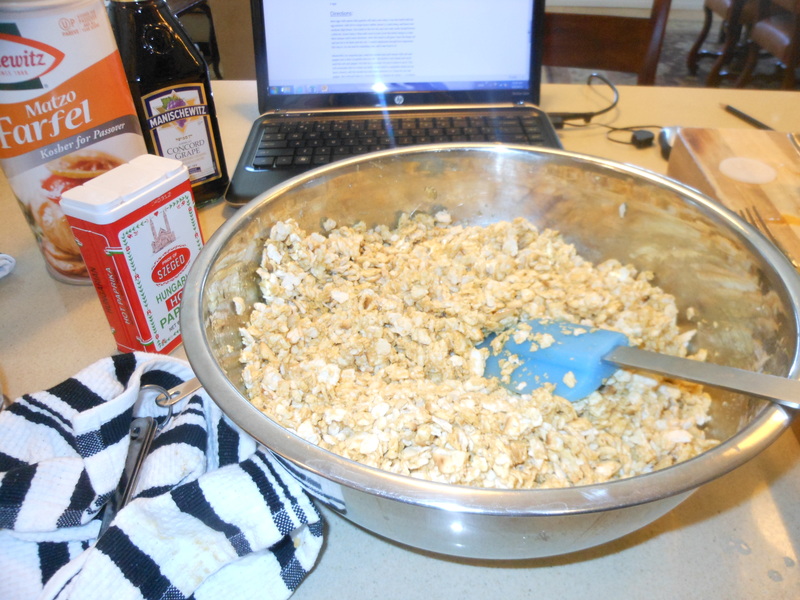 This entry was posted in meatless, Passover Recipes, sides and tagged Grandma Regina's Farfel for Passover, holiday recipes, Matzah Farfel for Passover, Passover Recipe. Bookmark the permalink.